The Champion Oil’s sponsored 2011 Ford Fiesta built by M2 Motoring for the SEMA Ford Motor Company Booth earlier this month is now headed to the CES Show at the Las Vegas Convention Center. The eye-catching and tricked-out purple vehicle has garnered a lot of international and local print media, along with a lot of Internet press. 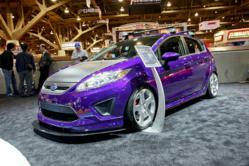 The Champion / M2 Ford Fiesta will be displayed at the 2012 Consumer Electronic Show (CES) in the Audiovox booth #10404. CES is world's largest consumer technology tradeshow and will run January 10-13, 2012 in Las Vegas, Nevada. This year, vehicle OEMs account for nearly two-thirds of $9.3 billion in wholesale aftermarket industry shipments. Audi, Chrysler, Ford, GM, Kia, BMW, VW, Lexus, Land Rover, and Mercedes all will showcase technology advancements on the CES show floor. Champion “SynGold” full synthetic motor oils are uniquely designed to help provide outstanding levels of fuel economy performance, cleaning power and engine protection, even during longer oil change intervals. “SynGold” is proven to significantly reduce wear and viscosity breakdown because of its advancements in oil technology. “SynGold’s” premium mixture of synthetic base fluids and performance additives outperform all previous engine oils for protection and durability from wear and viscosity breakdown. “SynGold’s” wide range of viscosity grades fit all types of modern vehicles, including high-performance turbo-charged, supercharged gasoline multi-valve fuel injected engines found in passenger cars, SUVs, light vans and trucks. About the company: Champion Brands, LLC, is a globally recognized industry leader in specialty lubricants for over 55 years. Champion also produces and blends over 300 products including fuel, oil, engine additives, and lubricants for the automotive, racing, heavy truck, agricultural, industrial, and specialty markets.